Mr. Kitty was born in 2003. He came to the farm after he and his two siblings were found abandoned. He was adopted out shortly after he came and then was returned in 2013 because he was peeing outside the litter box. Mr. Kitty is quite the character. Everyone who visits falls in love with him. If it weren’t for his one little bad habit….. but it seems he is quite content to stay here with us and his other cat friends. 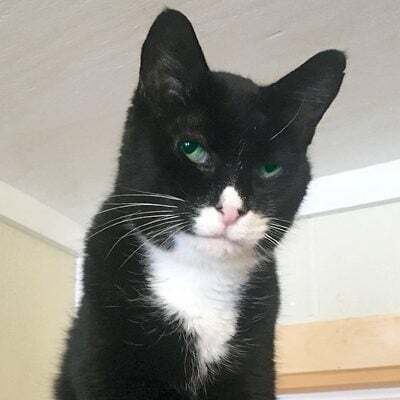 One of his caretakers says she pictures Mr. Kitty as an opera star, like from Phantom of the Opera, always walking around with a rose in his mouth. Very theatrical. He uses this talent well to attempt to persuade us to give him canned food or treats, let him out of his room, or as a way of apologizing for peeing on the new blanket that we just brought into the room. To Sponsor Mr. Kitty: Sponsorships are $100 for one year. Click the Sponsor Me button above and be sure to write in “Mr. Kitty Sponsor” in the Comments section on the form. You can go to our Sponsor Page for more information.